As some readers will already know, several articles which were critical of Maitreya Project have recently appeared in the media (although not in Mandala magazine!). Even though they contained errors and were misleading, they were widely distributed and picked up by websites and online blogs. We understand that it is easy for a project of this size and scope to be misunderstood. The Project is happy to have this opportunity to respond in order to set the record straight. 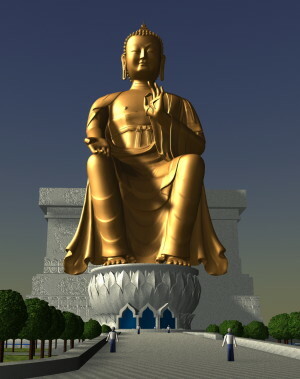 Maitreya Project has been accused of acting irresponsibly for not negotiating directly with landowners in Kushinagar, Uttar Pradesh (the proposed site for the Maitreya statue), and for supposedly allowing the state government to purchase land from poor farmers without adequate care and compensation. The reports claim the Project is allowing this to happen even though Indian officials have a reputation for corruption. Further, some claim that Maitreya Project is acting from a motivation of arrogance and spiritual materialism. They call for the immediate end of the Project. These accusations assume that corruption and opportunism will prevail. They assume that if one cares for social justice and human rights it is impossible to work with India’s governments. They also assume that large scale development in areas of poverty will bring benefit only to those who already have money and those who are willing to make a fast buck at the expense of humanity.